Mention the term all-inclusive resort and you’re bound to get a range of opinions. Some will likely say that all-inclusives are cesspools of tourists, devoid of any culture, and not a ‘real’ travel experience. Others will argue that they love the stress-free atmosphere at the resorts, even going so far to say they would never travel any other way. We’ve heard both sides of the argument plenty of times. But it was only earlier this year that we had the opportunity to form an opinion for ourselves. 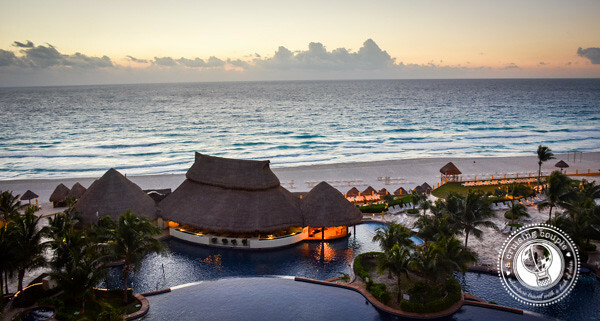 If you’re going to stay at an all-inclusive resort, where better to do it than in Cancun? 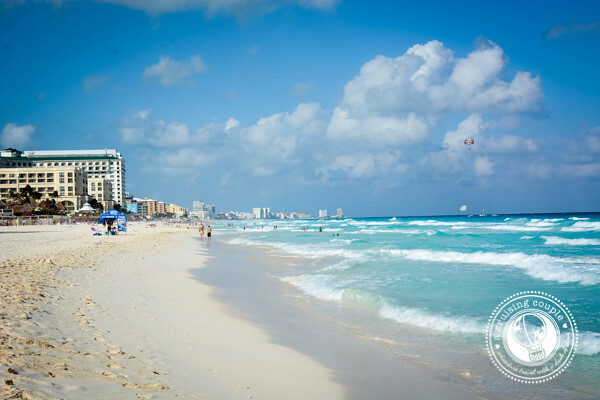 Cancun is a Mecca for all-inclusives, coming in at nearly 200 in and around the ‘Hotel Zone’. We stayed at Fiesta Americana Condesa, a resort that tries to incorporate Mexican culture into the hotel’s theme and décor. While we didn’t feel transported to a traditional Mexican village, we did appreciate some of the small details that show how Fiesta Americana is trying to embrace the local culture. 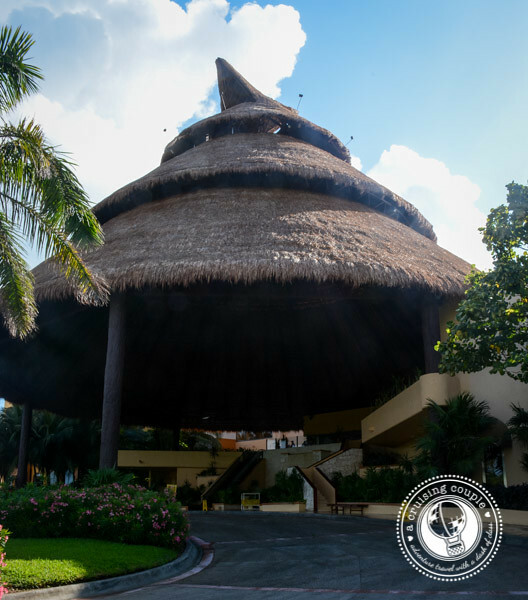 For example, the hotel is home to one of the largest thatched-roof palapas in the whole country, and its Mexican restaurant claims to take you on a culinary journey through all the regions of Mexico. 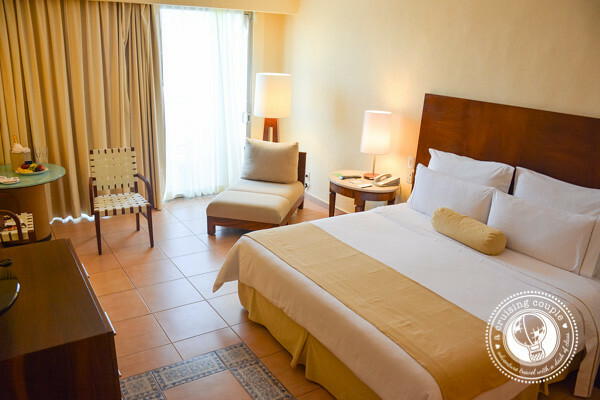 From the moment we arrived at Fiesta Americana, we were treated like VIPs. Our spacious room looked straight out to the ocean. A welcome of fresh fruit and champagne was set up on a corner table. A telephone call from reception made sure we were satisfied with our room. 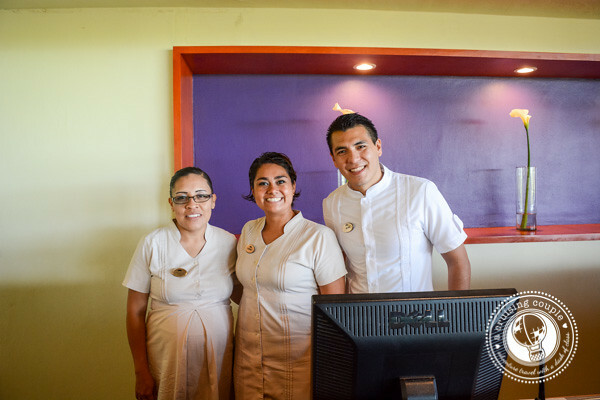 For the duration of our stay, the staff went above and beyond to insure that we were comfortable, whether it be with drink service on the beach or an extra serving of guacamole at lunch. But while we might have felt like VIPs, Fiesta Americana was just treating us with the same care and devotion that all hotel guests claim to receive. Fiesta Americana has 4 different restaurants and 2 lounges, so there is never a shortage on food or drinks. The formal Italian restaurant Rosato was easily our favorite, though we also enjoyed the authentic fare at the restaurant El Mexicano. 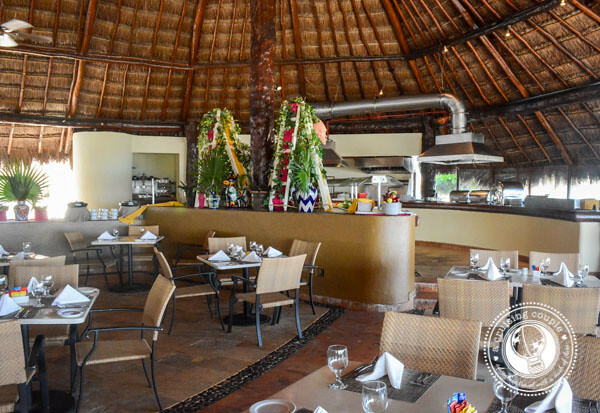 Most of our days were spent exploring the local arts and culture, but we did have a satisfying lunch one afternoon at the open-air palapa of the Cevicheria. When it comes to the cocktails, they’re strong and flavorful. The margaritas weren’t our favorite, but some of the other guests we met loved them, so perhaps we were spoiled after drinking the best margaritas on the face of the planet (and also the size of our face) in San Pancho. However, the staff had no problem creating special requests; they happily made Casey quite a few delicious French 75s (champagne, gin and lemon juice) during our stay. 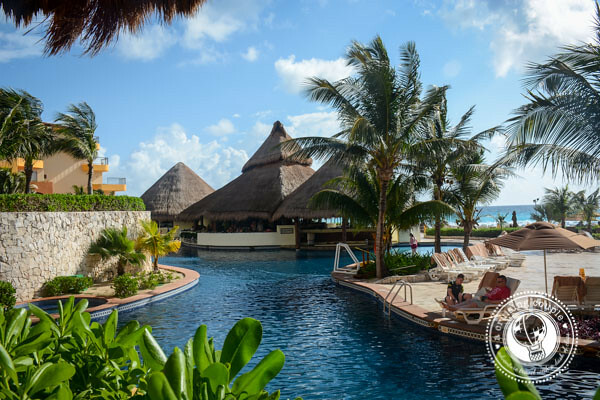 The great thing about Fiesta Americana Condesa, or any all-inclusive resort, is that you can do as much or as little as you want. We honestly didn’t even have the time to dip our feet in the cascading swimming pool or grab a drink at one of its swim-up bars, though we can say the cool water certainly looked tempting. 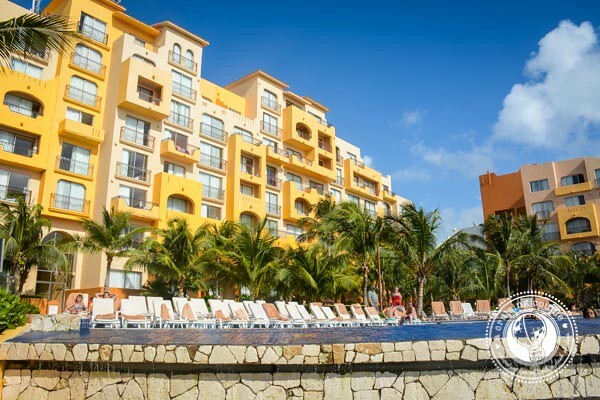 Fiesta Americana Condesa also has a gorgeous white sandy beach (with drink service), yoga classes, scuba diving, volleyball, a health club, children’s clubs, and more. While it’s tempting to stay within the grounds of Fiesta Americana, don’t do it. The resort is just a stone’s throw away from world-renowned snorkeling, museums, Mayan ruins and other adventure activities. After three nights at Fiesta Americana Condesa, we can positively say that we would have extended our stay if we could. However, that’s not to say that an all-inclusive resort is for everyone. The Carefree Vibe: Sometimes all you want to do is absolutely nothing. The all-inclusive experience is the epitome of relaxation. No long bus rides, no waiting in long lines, and no searching for ATMs. Just sit back and soak it all in. Psychologists have also proven that staying at an all-inclusive resort actually leads to a more relaxing vacation, as you don’t get stressed by pulling out your wallet for each and every purchase. The Affordability: All-inclusive resorts can actually be very budget friendly. Sure, the food might not be the best and the liquor likely won’t be top-shelf, but it sure beats making pasta at a hostel. Do your research to find which resort offers the amenities that are most important to you, such as a workout room, three pools, ocean views, etc. The Options: All-inclusive resorts are sort of like cruise ships. There are plenty of activities to keep everyone happy. Is someone hungry? No problem. They can go enjoy one of the 24-hour restaurants while you head out to explore the beach. There’s less pressure to spend every waking moment together while still actually getting plenty of time with each other. The Culture: Unless you plan on hanging out with the staff a lot, your encounters with the locals are going to be limited. 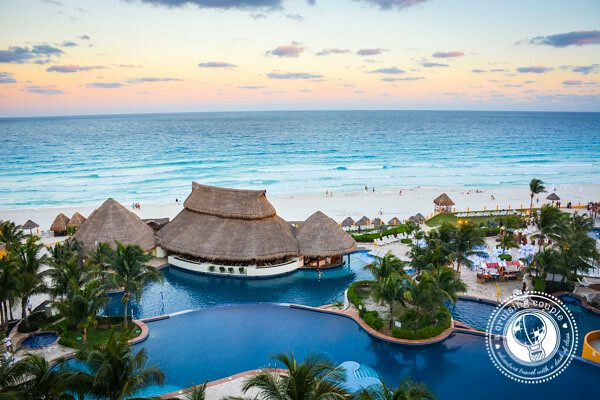 An all-inclusive resort is also not the best if you plan on exploring from dawn until dusk; you simply won’t get to take advantage of all the benefits. The Thrill of Travel: All-inclusives are made to be easy. If you’re looking for a once-in-a-lifetime adventure, then maybe try something like cross-country skiing in Swedish Lapland. Like all things in life, find a balance between exploring and relaxing. Just because you’re at an all-inclusive resort doesn’t mean you have to spend all of your time by the pool. There is plenty to see and do outside of most all-inclusives. You just have to be willing to find it. Have you ever stayed at an all-inclusive resort? What did you think about it? We were guests of the Cancun Tourism Board during our stay. All thoughts and opinions are our own. Nice breakdown Casey! I haven’t, but my girlfriend did so about a year back. She liked it for about a week, then felt stir crazy because we like to move, to travel, to explore all over the world. Thanks! Thanks Ryan! I definitely think that any longer than a week, and I’d be ready to move around, too. I’m not good at staying in any one place for a long time though! My husband’s family is really in to all inclusives….and let’s just say I am very much not! Thanks for the added perspective and your experience–maybe I could be content for a few days if I could go see and do other things. I have just done it, we recently came back from a week in Sicily and I had to book a room in a resort as a last minute booking cause everything else was sold out. It wasn’t that bad, the resort was quite nice actually, but as you said there’s no thrill of travel and having breakfast with the screams and music from the organized activities at the pool made me feel a bit old. I completely agree with so much of this! My first all-inc experience was also in Mexico at Riviera Maya and I must admit, overall I enjoyed it. Like you say, you don’t have to stay there all the time so we ventured off to do some other things including visiting Chichen Itza but overall, it was good fun knowing that there were so many activities and food & drink available to us and it was certainly relaxing, convenient and cost effective! 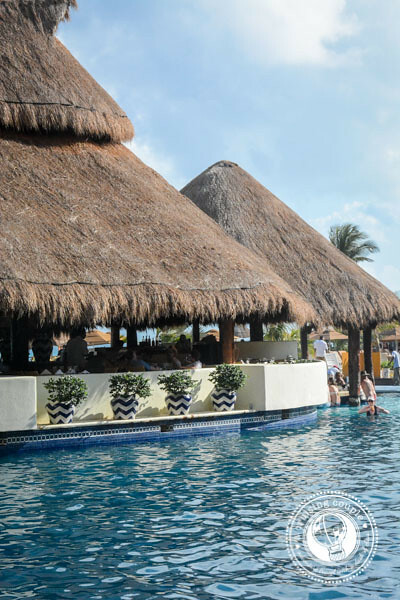 We’ve stayed at an all inclusive one time, also in Mexico (near Puerto Morelos), and we loved it because we could take the relaxation to a whole new level. And when you’re suffering from chronic pain you really appreciate to do that. BUT we couldn’t be at an all inclusive anywhere… In Mexico we had a good choice of restaurants, and there so many day trips you can take part in, or just take a cab to where ever you wanna go. We have been traveling “a lot” this year, and wanted to end this year on the same place and relax a bit :) So we’re going back to Mexico, and really can’t wait. You didn’t get in the pool??? To me, that’s the greatest benefit of the all-inclusive. They always have the best pools! We stayed at a resort on Koh Lanta for five days and very rarely left the pool, especially since the staff constantly brought refreshments straight to our chairs. But while that was certainly relaxing at the end of a two-week trek across Thailand, it most definitely didn’t expose us to the local culture and the food wasn’t anywhere near as good as what we’d had elsewhere in the country. Like you said, striking a balance between travel styles is key. Haha I know, it should be a crime! We’ve since stayed at another all-inclusive and spent a lot of time in that pool to make up for it ;-) Great to hear that you found a good balance between relaxing at the all inclusive and experiencing the ‘real’ Thailand! Have fun this vacation when you visit the Mexico tourism destination.